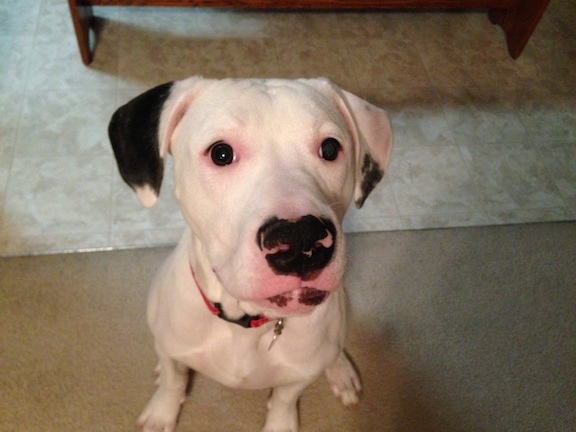 Rocco is a five month old American Bulldog. His owners contacted me for help with the aggressive behavior he was showing to house guests and some confidence issues. When I met him for the session Rocco was extremely excited; jumping and darting around the room in an animated way. He was not happy with my arrival and barked his disapproval while running away or returning to sit or lean next to his owner before repeating the cycle again. Each time that Rocco was next to or leaning on his owners, they would instinctively pet and scratch him in an attempt to calm him down. But when you provide a dog with attention or affection when its in an unbalanced state of mind, you are actually reinforcing the state of mind. Its almost as if the dog thinks you are petting it for the behavior. In this case, Rocco’s owners had been reinforcing the exact behavior they wanted to eliminate, territorial aggression. Each petting session while he was barking had communicated; “Thanks for being our security dog.” Over time, this can lead to behavior issues and that was clearly the case with Rocco. I would summarize his behavior as insecure dominant. He was engaging in some aggressive behaviors, but hesitantly. He was clearly unsure of himself. The first step in rehabilitation is to stop the reinforcement. I suggested that the family look at petting or providing attention as “paying” Rocco. And to only “pay” him for behaviors or actions they want. If Rocco scratches for attention, they should tell him to sit or lie down, then pet him while repeating their command word. This is called positive reinforcement and its a time tested technique that works for pretty much all dogs. I started out with a leadership exercise to help Rocco see and identify with his owners in an authoritative position. Normally I demonstrate these exercises myself, but Rocco was so reactive to me that I thought it would be better to coach his owners through it themselves. We were able to go through the exercise twice, but Rocco was showing a lot of resistance and stubbornness. This exercise usually only takes 15 minutes to master, but after an hour it was clear that Rocco was stuck and almost defiant in his aversion to cooperating. I switched things up and over to an exercise I frequently use for dogs who are fearful of their kennel. This exercise involves leaving the door to the kennel open, but communicating a boundary of the kennel door to the dog so that it restrains itself and doesn’t exit the kennel until given the command. As soon as we used the kennel, we made an immediate impact. His energy level dropped as did his stubbornness. The leadership exercise had helped, but not like this. It only took a few minutes before he took on a follower position in the kennel. As soon as he did, I had his owner give him permission to come out and reward him while repeating the “come” command. After a few repetitions, Rocco was more respectful while also appearing more confident. He was carrying himself higher and no longer hesitating when moving around. When his owners commanded or corrected him, he responded right away. He even took direction and accepted corrections from me without protest. It will be important his owners continue to practice and reinforce this new leadership position for Rocco to start to self identify as being in the follower position. As his self esteem and the respect for the authority of his owners increase, his reaction to visitors will change. He will likely have a few lapses when surprised, but as they practice and continue to reinforce the leader follower dynamic, Rocco will be able to relinquish his job as the home’s security Bulldog.